Uncategorized « Spine Solvers Inc. I wanted to let you know how great my son has been feeling this week. To give you some history, my son is 14 and has been suffering for the past few years with heel pains. This past summer he was diagnosed with Sever’s Disease which means his growth plates in his heels aren’t closed yet and he is getting irritation at the growth plate when he runs. My son is a very active soccer player. The podiatrist informed us there wasn’t anything to do except stop all sports, ice, take anti-inflammatory meds, and wait until his growth plates are closed before resuming sports. He refused, so we tried to monitor his activity but he did eventually break his right heel last fall and ended up on crutches for 6 weeks. With spring soccer he immediately complained of heel pain again, but this time only in his left heel. X-rays were taken and there wasn’t any fractures but the growth plates are still open. This time we are being more careful and my son only plays in his soccer games on the weekends. He does not attend school gym classes or soccer practices. He does go to the gym 5 times a week for weight training, swimming, and bike riding. He has been constantly stretching his AT on a slant board in his room, icing every day, and taking Advil up to 8 times a week. I taped my son this Sunday night with the technique you showed me at the end of the class. He reported pain at the Achilles Tendon but not at the base of his heel after an hour. I had him keep it on and the next day when he came home from school he said he didn’t have the pain anymore (any pain). He continued with stretching and his gym program all week. We went to the podiatrist this Thursday (4 days with tape on) and x-rays continued to show growth plates on both heels were still open. 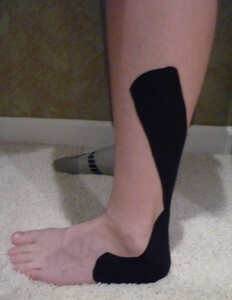 The podiatrist said to continue with whatever is working since he wasn’t familiar with Kinesio Taping. I removed the tape Thursday night and my son reported the pain returned within 5 minutes of weight bearing. I re-applied new tape as instructed and he stated the pain was gone within 2 minutes. The best part is my son told me he ran a 61/2-minute mile Wednesday night and had no pain. He ran again doing a 7-minute mile Thursday night and reported no pain. It is now Friday and he has not taking any Advil since Sunday and isn’t in pain. Thank you so very much!!!! I will keep you posted until his growth plates are closed to see if this technique continues to provide him relief. I took pictures of how I applied the tape too. The attached pictures are what is on my son now. He still hasn’t taken any Advil since Saturday. He is reporting a little pain today but feels it is the ½ inch heel lift the podiatrist put in his shoes Thursday. The podiatrist wanted the lifts in for max 7 days to see if benefited him. We removed them tonight and will see how he feels tomorrow. The Strap does go under his heel which extends up across his AT and to his medial and lateral calf. He hasn’t been to the gym to do any activity since running Thursday night for a mile. The other thing I noticed is he is putting his heel down in the house when in his socks. Before he walked on his forefoot because his heel was too sensitive.